Choosing Natural Gas means fewer repairs and less maintenance, less pollution, and less waste. Natural Gas is more reliable, more efficient, more comfortable, and very affordable. With Natural Gas – Less is more! We know you want the Best for your family. Click Here to sign up for Paperless Billing. It is a FREE service that saves paper, time and money. After signing up, you will receive an email notification when your bill is ready. You can view your bills, sign up for automatic payments and manage multiple accounts. In order to receive the first 250′ of service line and 250′ of main line for FREE, a customer needs to install a 40-gallon natural gas water heater, and/or a natural gas heating appliance of 50,000 BTU or greater. All appliances added to the original requirement will earn an additional 50′ of FREE service line footage. Customers now have the convenience of paying their bill online or by Interactive Voice Response. Click here to pay your bill online or call toll-free, (855) 784-9212, to pay by telephone. Incentives will be paid to the customer installing additional natural gas appliances, or if the Gas Company installs them for you, the respective credit will be applied to the installation contract. Serving our customer is our job. Our well trained, qualified professionals are available to you 24 hours a day, 7 days a week. We maintain a large inventory in our warehouse to serve you better. 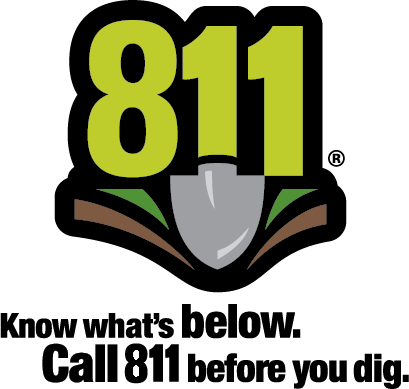 811 is the federally designated call before you dig number that helps homeowners and professionals avoid damaging these vital utilities. When you make the free call to 811 a few days before you dig, you’ll help prevent unintended consequences such as injury to you or your family, damage to your property, utility service outages to the entire neighborhood and potential fines and repair costs.